Adrian De Leon was living a block away from Danzig Street in Scarborough when one of the worst mass shootings in the city’s history took place. In July of 2012, rival gang members opened fire at a crowd of 200 during a community street party, killing two people and injuring 23. “I think we’re still kind of reeling from that moment,” De Leon says. 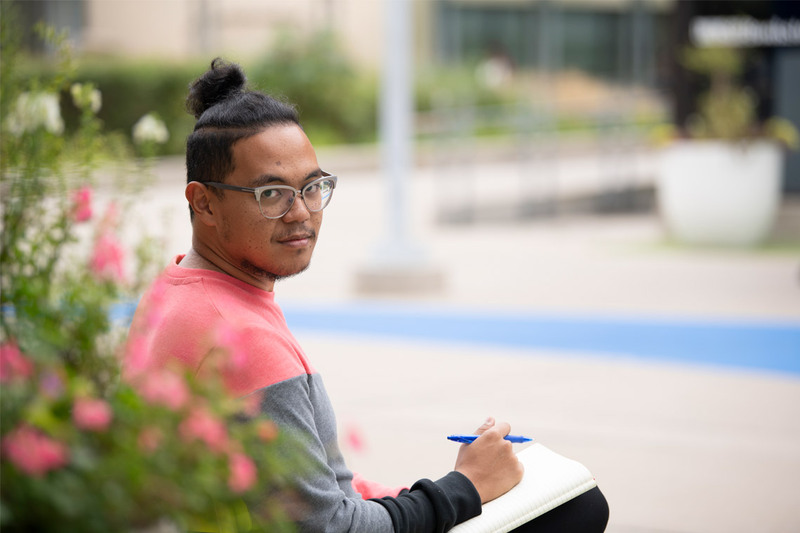 For De Leon, a U of T Scarborough alumnus finishing his PhD in the department of history, the result was a book of poetry called Rouge. The book, which De Leon first drafted for a creative writing class, was released on Oct. 26. It is the first full-length book published by a former creative writing student at U of T Scarborough. Listen to an interview with De Leon on CBC's Metro Morning. “When you talk about a particular event, they specify the intersection if it’s in Toronto. If it’s in Scarborough, they just say Scarborough,” says De Leon. The book flips that script, making it clear Scarborough is an integral part of the city, connected in myriad ways. From 2013 to 2014, De Leon travelled to every subway stop on the TTC, researching and observing as he went. He wrote each poem at its namesake subway station and found “a poetic moment” no matter how tired or dilapidated the station. The result is a book that traverses poetic forms, points of view, history and community, with poems that range from playful odes to somber reflections. De Leon’s most traditional poem is a sonnet, written at one of the most underused stops in the system: Bessarion Station, which was built in anticipation of a condo boom that never happened. For Broadview and Castle Frank stations, De Leon wrote about the brief moment of cell service that riders get when travelling across an outdoor section of the track. Dundas is a set of haikus on how to make the TTC operator hate you. Rosedale is written in crude computer code. The book culminates in a pair of poems, both titled Rouge. The first takes media responses, tweets, songs and text messages from during and after the Danzig Street shooting and deconstructs them into a poem. The second is a lyrical response to the event. Growing up in Scarborough, De Leon spent his time hiking the Rouge Valley, exploring the Scarborough Bluffs and frequenting community areas, like parks and strip malls. But he rarely went to downtown Toronto. Transit was often a barrier for De Leon. He regularly took the “dizzying” trip on the 116 bus, and would often get carsick as the bus hit potholes on the road. As he grew up, he watched families wake up earlier and earlier when bus routes were changed or made less frequent. “I drew that connection with this book, behind the kind of othering of Scarborough as that which is at the east, but is infrastructurally made inaccessible,” De Leon says, mentioning the gradual movement of funding away from Scarborough. His PhD research focuses on food studies and history – and his favourite poem, written at Warden station, is about the Jamaican patties and cocoa bread sold in the upper level. Last year, De Leon was awarded a prestigious Fulbright Scholarship for his research, and travelled to Seattle and Hawaii to gather data. His research focuses on rethinking Philippine ethnic history in the U.S., by exploring how migrant workers and Indigenous people have been racialized through history. A book launch for Rouge was held on Oct. 30 at U of T Scarborough’s Doris McCarthy Gallery.